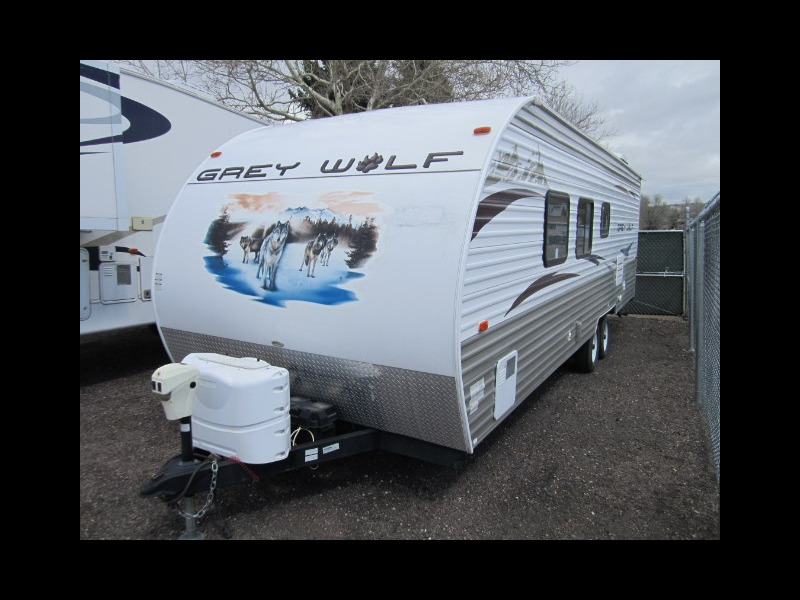 2012 Forest River Cherokee Grey Wolf 26BH 29' travel trailer. Reduced thousands for hail damage. Exterior features electric stabilizing jacks, electric power front hitch jack, outside speakers, TV hookup, power awning, bike rack, spare tire & carrier and exterior storage. Interior features include 19" flat screen LCD TV that can be moved to outside, AM/FM/CD stereo & DVD, dinette/bed, couch/bed, double bed, queen sized bed w/ nightstands & reading lights, microwave/hood combo, skylight, power roof vent, head w/ tub & shower, wardrobe closets, large overhead storage cabinets, A/C and furnace. Comes with a clear Colorado title. Only weighs 4,500 lbs dry. Colorado law requires proof of insurance in order to print a temporary license plate. Please bring your policy number with you. We do not have any financing here at the dealership, we can work with your bank or refer you to a lender. Current and former military members & their families should check out the great rates at USAA. Visit Colorado's Best Used Cars online at www.cobestusedcars.com to see more pictures of this vehicle or call us at 719-368-6081 today to schedule your test drive. We offer LOW "NO HAGGLE" pricing and NEVER charge our customers any "DEALER FEES". Don't forget to ask about our extended warranties. Colorado law requires proof of insurance in order to print a temporary license plate; please bring your current insurance card with you. We do not have any financing at the dealership, we can work with your bank or refer you to a lender. Current and former military members & their families should check out the great rates at USAA. Visit Colorado's Best Used Cars online at www.cobestusedcars.com to see more pictures of this vehicle or call us at 719-368-6081 today to schedule your test drive. We offer LOW "NO HAGGLE" pricing and NEVER charge our customers any "DEALER FEES". Don't forget to ask about our extended warranties. Taxes not included in advertised price. Message: Thought you might be interested in this 2012 Forest River Cherokee.